Thanks for stopping by! While you’re here, you can take a look at Museum of the Americas, my new short story collection. You can buy a signed copy, too. If you’re looking for a copywriter, book editor, writing teacher, or workshop leader, just check out my Writer for Hire section, then send me an email. It’s easy—just click the little envelope at the top of the page. Sign in here, and I'll keep you notified about upcoming events, new publications, and more. I won't overwhelm your inbox. And I will respect your privacy. A roadside museum with a link to the supernatural. A washed up pitching phenom remaking his life as a minor league mascot. An elderly magician concealing a devastating secret. A grown-up high school bully obsessed with her former classmate’s glass eye. In Museum of the Americas, Gary Lee Miller presents a remarkable collection of stories that push the boundaries between the real and the fantastic, the universe that is seen and the one that is invisible. There are no easy answers here, no moralistic judgments, just people struggling against stacked odds to bring redemption to their lives. 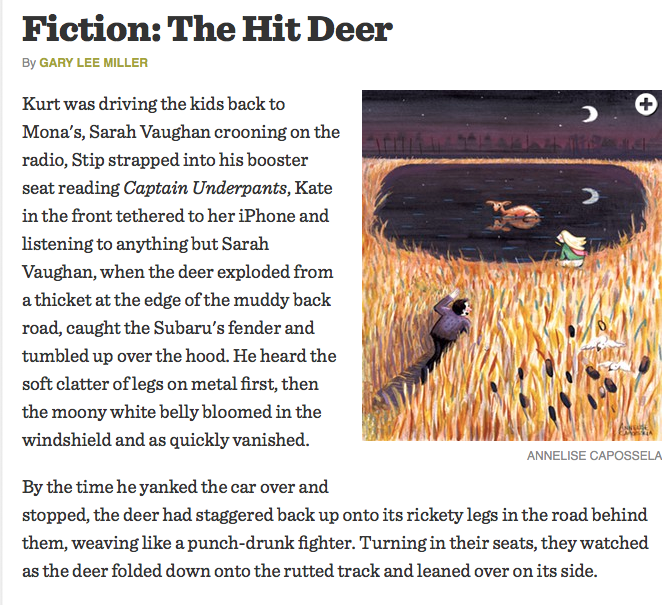 Click below to read my short story "The Hit Deer" in Seven Days.